Hi there!! Welcome to Kate's Surprise Blog Hop!!!! Today is Kate's birthday and we decided to put together a cute little Tropical themed birthday hop! If you came from Trixie you are in the right spot! I love Kate's coloring and wanted to color an image for her! I know I don't color anywhere near her level but I had fun too! Hula Anya is from The Greeting Farm and is on a Wobble! She can do the hula!! Stamp is from Jaded Blossom! Your next stop is Julie from Cricut Chick! this is adorable!!! I love the beautiful image!!! TFS and Happy Birthday Kate! Really cute card! Love the burlap type background. This card is cute. I love the burlap on it. Aww Girl you did Perfect. Thank you so much. Love your card and also the background, beautiful. 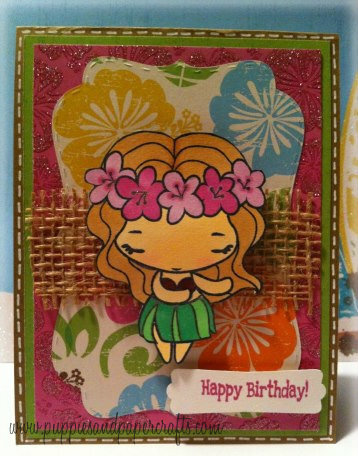 LOVE LOVE LOVE the coloring on your hula girl! I love it!! She is so pretty!! So very nice of you gals to do a bday hop! Love this little hula girl! Background paper is very pretty. Thanks for sharing. awwww! She is so sweet!!! Love this colorful birthday card. Great coloring and love that she is on a wobble! I love love love this! Your coloring is awesome! Great job my friend! this is too adorable!! the fact that she's on a wobble makes it even better! love the coloring, what a cute card! I love the paper too. Awesome image! You did a fabulous job of coloring and your design...amazing and fun! Great job! Super cute! Thank you for sharing Kim and happy Birthday to Kate! Great touch of texture. Burlap and a wobble. Nice job coloring. Your card is simply adorable. TFS. oh my gosh, I absolutley love this! the different cuts and papers made for a wonderful card! Great project!